For two years, veterinary residents from Cummings School have had the chance to observe their physician counterparts during weeklong rotations at Tufts Medical Center. The veterinary specialists-in-training participate in hospital rounds and watch the physicians interact with patients and their families, work up diagnoses and perform surgery. The exchanges “could be a very valuable experience,” says Douglas Payne, a former cardiothoracic surgeon and professor emeritus of surgery at Tufts. The only medical school faculty member on Cummings School’s board of advisors, Payne partnered with Berg to create more interaction between Tufts’ Boston and Grafton campuses. They launched the exchange program in fall 2012, sending veterinary cardiology resident Vicky Yang, V09, to Tufts Medical Center for a week; three other veterinary residents followed. This year, six residents and two Cummings School faculty members participated. “We thought it would be a nice opportunity not just for [Yang], but also for us to learn about the kind of work they’re doing at the veterinary school and about possibilities for research collaboration,” says Ayan Patel, a professor of medicine who hosted Yang during her rotation. Yang, who studied engineering as an undergraduate, was eager to see the state-of-the-art imaging technology at Tufts Medical Center. She was particularly interested in the hospital’s 3-D echocardiogram machine, which provides a moving image of the beating heart that reveals its size and shape as well as how efficiently it is pumping. Most veterinarians won’t get their hands on these machines any time soon. The latest technology generally debuts in human medicine because of the greater volume of patients and the insurance-payment model, Berg says. But many innovations in medical technology eventually end up in the veterinary clinic, so it behooves a young vet to get a jump on handling them. But the veterinary residents say that not every lesson comes with a big price tag. Tracy Sutton, V11, a neurology/neurosurgery resident who completed her rotation in March, says she appreciated learning more about human medicine because many owners’ expectations about pet care come from their own experiences. Pet owners often ask her about spinal fusion, in which two or more vertebrae are bonded after disc surgery. That’s not a standard procedure in dogs, but many of Sutton’s human clients have had it. Before the Tufts Medical Center rotation, Sutton says she wasn’t sure how to address their concerns about their dogs not getting the gold standard of care. Sutton learned that fusion helps stabilize humans’ upright spines, but dogs’ horizontal spines don’t require as much support. 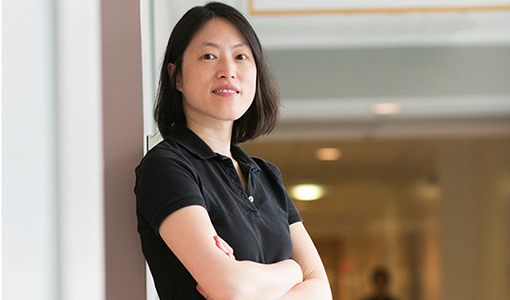 Yang says she learned a simpler way of calculating the size of an aortic stenosis—a narrowing of a major heart valve that can lead to cardiac damage—from her human medical colleagues. Some of the rotations’ more intangible lessons underscore the ways in which the two professions overlap. Physicians and veterinarians both grapple with families’ grief and loss, notes Berg, and both professions encounter the occasional challenging personality. Veterinarians often lament that their patients can’t tell them where it hurts, says Melissa Bucknoff, a third-year veterinary resident in emergency and critical care who completed a hospital rotation last fall. The veterinary and medical residents predict they will consult with each other and perhaps work together on cases or research projects. That kind of interdisciplinary collaboration was the goal of the resident exchange in the first place.